Norman’s taxidermy dog, sitting in the empty room Norma still checks in on, cuts to the heart of this episode: An invisible connection, and the certainty of something dead. The rest of it you can find in Norman’s art project: A grotesque, half-built imitation of a dead thing, by someone longing for the comforts of home. The pivotal scene of this episode—in which Norma gives up her shot at happiness and agrees to let Norman come back—is one of the most uncomfortable the show’s ever had, which is no small claim. And it’s as painful for them as it is for us, because of the lifetime of weight each of them is carrying. It’s painful for Norman, who’s barely begun to understand the depths of his disorder; his monster has a name, but he’s still missing the weapons to fight it with. And it’s even more painful for Norma, who’s been taking risks with her trust that actually pay off. Romero’s not going anywhere because her past is complicated. Romero is all in. Romero bought a giant TV. He’s in that house for the duration. It’s just that—as Norma must have known, given the way her face falls the second she gets on the phone—that duration was never going to be very long. Norman needs her, and Norman always wins. Bates Motel has managed an almost-impossible high-wire act this season, presenting impossible positions that quietly stand firm against What Ifs. This feels particularly important for Norma. We know that Norman ends up fine, for Bates Motel values of “fine.” It’s Norma who’s in trouble. And her desperation makes her an easy target: if Norma had only told someone Norman held her at gunpoint, if she hadn’t offered him that chance to sign voluntary admission papers, surely it would all be different now. I’m not sure that holds. Among other things, this robs Norman of a lot of his agency. (We see how devastating it is to call his own house and have to ask someone who’s lying to him if his mother is home; we feel for him as Norma/n manifests to protect him from devastating trauma. But Norman wants to go home to wreck his mother’s happiness, and he knows that’s what he’s doing.) But we also know that for Norma, love and penance are closely connected. And we know how deeply Norma is invested in the idea of Norman as having choice, as being able to move forward rather than just run from. 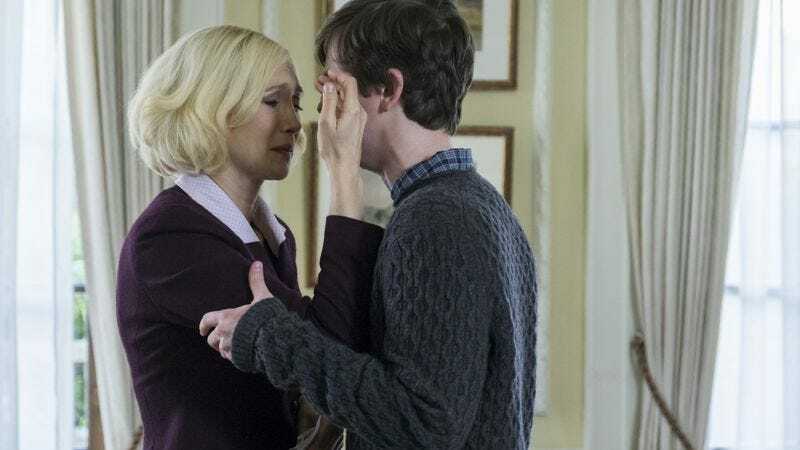 It’s almost as deeply as she’s invested in whatever will keep the two of them together, for Bates Motel values of “together.” She hoped he’d be willing to go; she was always going to let him come back. And the greatest achievement in “There’s No Place Like Home” is how hollow a victory it is for Norman. He gets to go home, but they’ll never be together again. In a break from last episode, in which Norman was achingly sympathetic, this episode very intentionally presents Norman at his most self-aware and manipulative, and then asks if we still feel for him. (The foreshadowing on “I know how to make the world see me as normal” is a mile long.) That sympathy hinges, I suspect, on whether you think Norman is manipulating Edwards and Norma in the same way. Certainly, it’s related; Nestor Carbonell (who directed the episode) positions Norman and Norma as halfway to an eclipse; an awkward intimacy that’s off-center but not quite far enough away to give one another breathing room. It’s deliberately echoed when Norman turns on the waterworks for Dr. Edwards. But I’m not convinced it’s the same. If Norman had begged Norma to come home so he could feel “complete, and whole, and safe,” she’d have melted sooner. Instead, Norman can barely hold back his anger, his resentment, his fear of being replaced—it’s honest despite him. Unlike Edwards and his starry-eyed hopes of a model patient, Norma’s under no illusions about who she’s bringing home; she’s just doing her penance. Still, it’s a cold homecoming. We’re inching closer to the end—both of the season, and given that Dylan’s investigating Audrey’s disappearance, probably to a couple of relationships. And we know from earlier this season that Norma is no longer as scared for Norman as she is of him. She still loves him, and she still needs him—so much she torpedoes her life and the lives of everyone she knows by letting him come home—but some bells you can’t un-ring. And of course it only complicates things that in Norman’s absence, she’s found something else to fight for. Not in the short term, obviously; in the short term she does what she always does after an opening volley and deflects until the evidence pins her down. But this time it’s Romero she’s lying to protect. “I don’t know what you’re talking about, Norman”; the show has given us a scene of Norman holding her at gunpoint, and this still feels like the line that actually opened up Norma’s grave. Not because she lied to Norman—she’s lied to him before—but because it’s the sort of lie she tells other people. Norman won’t stand for being other people. Still, there’s only one axis on which this show has ever turned. At the end of the episode, Romero is quite literally out of the picture. The only people alive in the frame are Norma and Norman, in front of a house that’s so flattened by the camera it looks like cut paper; a half-built imitation of something with all the comforts of home. “Are you going to miss your mommy tucking you in?” When Norman freezes, it seems less like anger or embarrassment than it is a careful refusal to consider that the old intimacy with Norma is already gone, and being at home can’t bring it back. Is that The Third Man? Oh, show. Carbonell’s directing sits the camera unflinchingly on a lot of people having very complicated, silent breakdowns of one kind or another. It’s really effectively claustrophobic. I know Romero giving Norma that money was meant to be him shedding the big secret and declaring himself definitively on her side. There was definitely an air of tender promise about it. It was probably wrong to laugh; and yet, that fleeting expression on Romero’s face as he realizes he’s been an increasingly iffy cop was too hard to ignore. Dylan’s best moments as a character are almost always when he’s quietly taken aback by the people he’s related to. However, full marks for gently holding Emma and promising, without aggrandizement or strings, “I want you. I love you.” Good timing, buddy. Hang on to that. Thanks to Alex for letting me drop in for another episode of TV’s most inescapable psychological quagmire!